Guggul (oleogum resin) an extract of Commiphora mukul. Guggul, has been used to treat various illnesses and diseases including obesity, but more recently supplemented for its powerful anti-oxidant and anti-inflammatory effects. Onlinestrength analyzed 10 best-selling guggul supplements in the United States, measuring total guggul (commiphora mukul) extract and guggulsterone quantities. Products that contained excess amounts of preservatives, fillers, and binder ingredients such as magnesium oxide and rice powder were penalized. Products that use hypoallergenic, vegetarian capsules moved up the ladder as they less likely to cause indigestion problems. Guggul supplements on the bottom of the top 10 list have excess amounts of binders and preservatives and used gelatin capsules which may lead to poor absorption and inflammatory issues. Guggul, an extract sourced from raw resin from the Commiphora mukul tree, is highly valued for its botanical medicine. 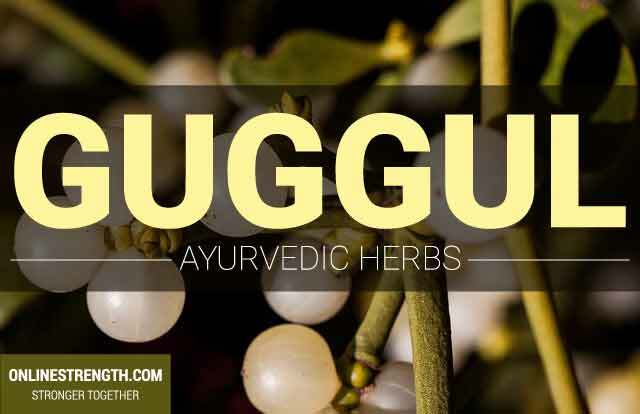 Used for thousands of years in Ayurvedic medicines Guggul is being used as treatment for many different ailments including treating acne, cardiovascular health issues, and other ailments that benefit from powerful anti-oxidant and anti-inflammatory properties. Guggul is supplemented for its very powerful antioxidant and anti-inflammatory effects. Guggul, has been shown aid the body in detoxification, strengthen the immune system, and help reduce inflammation. Recent but limited research shows that Guggul may be a very potent inhibitor of cancer cell growth. Safely used for thousands of years in the Indian Ayurveda medicine practice. Powerful anti-oxidant which may help heal inflammatory issues including skin conditions such as severe acne. Standard dosage: 400 mg – 500 mg guggul (commiphora mukul) extract (gum resin) with 25 mg of guggulsterone extract is to be supplemented thrice daily. 500 mg of guggul on average yields 2.5% (25 mg) of guggulsterone extract. Does not need to be taken with food.